In writing about longwall mining, I have gone into some detail as to how the technology initially developed, in part because of my own interests, but also because some of its features help answer questions about today’s industry and this will provide a background for those answers in future posts. Horizontal link bars fit between elements in the hollows that can be seen at the ends of the piece allowing flexibility in the joints. The face of the conveyor is the wedge shape, that faces the coal face. 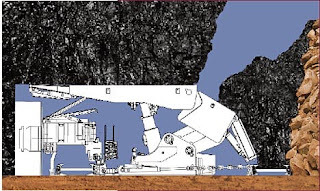 Coal is loaded onto the conveyor from the mining machine, and any coal left on the floor then rides up the wedge onto the conveyor, as it is hydraulically pushed forward after the machine has passed. (A point I will discuss later). The coal falls into the top trough of the conveyor. 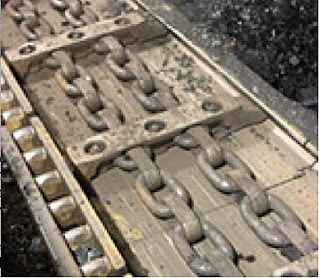 To move it along the conveyor, there are two chains, which connect to lateral steel bars called flights, which slide in the slots on either side of the top trough. 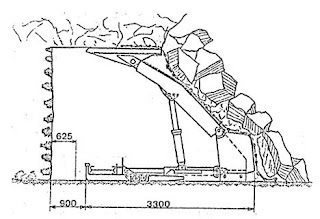 The chains drag the flights down the trough, pulling the coal that falls onto the conveyor with them, and at the end of the conveyor, the bed is raised, so that the coal is dumped onto the belt conveyor that runs in the entry tunnel to the longwall. (For historic reasons this is generally referred to as the Maingate of the longwall.) The empty chain and flights then return along the face in the underside compartment to the conveyor. The moving parts of the conveyor are thus now the chain and flights, and they are driven by a motor mounted in the maingate of the longwall. The arrival of this then new tool allowed a number of different changes to occur on the face. The first and initial requirement was for a way to move the conveyor forward after the coal had been mined out it front of it. 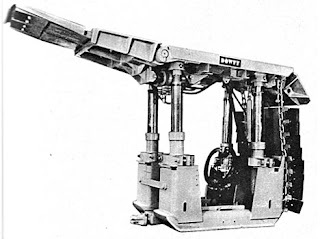 It was too big and cumbersome to disassemble and reconnect, and flexible enough that it could be pushed over using a series of hydraulic rams, one attached to each of the pans of the conveyor. But what could provide the resistance against which the rams could push? The only element in the face behind the conveyor are the roof supports. So these also had to be modernized so that they could work in this way. Initially the supports had been individual elements, two props and an overlying bar, all made out of wood. I had mentioned last time the arrival of hydraulic props, and steel bars. By combining these into a structure, with the props set on a bearing plate, and the steel bar at the top permanently mounted to their upper section, a simple support element was created. This, as we found out, didn’t have much lateral stability, and so they were combined in sets of two. 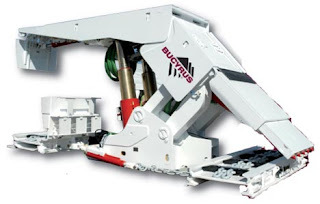 With a hydraulic ram on the front, this could now push the conveyor forward. The ram would also make it possible, after the props were lowered, to pull the entire unit forward, and then, after raising the props, reset closer to the face. The plates at the back then stopped the rock that was collapsing into the void left behind the chock where the coal had been been, from rolling into the working face. This became known as a chock. Over time the props became larger, and the canopy which was meant to extend over the conveyor to provide early roof support didn’t work that well. The idea was that it could be slid out, after the machine had mined the coal, until the chock itself could be moved. The problem was that if there was a heavy load applied at the tip it would bend the cantilever so that it could not slide. Then life became a little more difficult. The answer came from Hungary initially. It was known as a shield support. The design was extremely flexible and able to mine under conditions such as a badly broken roof that would not have been possible with normal supports, since the top and back (canopy) of the shield provided a virtual complete coverage of the roof and back of the working area, and the shields were installed adjacent to one another. There have been considerable advances in design, but of an evolutionary nature, since this particular breakthrough – which occurred in the 1970’s. 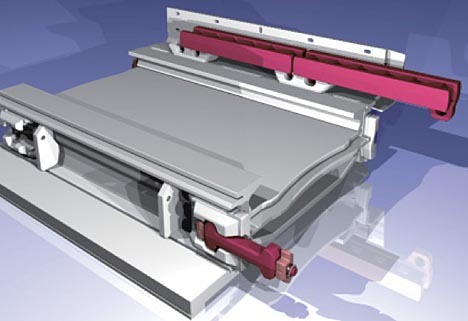 But in combination with the use of stronger and more powerful face conveyors these supports were able to make high-speed longwall possible in a wide range of differing conditions. It is even possible to mine out a thicker seam by taking the lower coal with a mining machine (of which I will write next time) and then letting the upper coal collapse onto the back of the support, from which it can be recovered using a second conveyor. (And not a lot of energy – Charlie). Support used for top coal recovery - its a lot more complex than a wooden prop. As I mentioned above, I’ll talk about the mining machines next time. Hi there. Nice blog. You have shared useful information. Keep up the good work! Your blog is really interesting and provides good details. Hydraulic Trolley suppliers in India, Industrial Hydraulic Cylinders. Nice way to let us know about it. I like it and hopefully others will do the best furniture same. Hello, I love reading through your blog, I wanted to leave a little comment to support you and wish you a good continuation. Wish you best of luck for all your best efforts. Hydro cylinder manufacturer Delhi, Hydraulic cylinder suppliers in Delhi. Nice blog post. Thanks for sharing this kind of information. Keep it up. Specialised Cylinder Repairs Pty Ltd specialises in everything to do with hydraulic cylinders. We combine our experience and our expertise to guarantee our customers the best quality and service. We are a company that provides premium service and experience. Whatever you need in hydraulic cylinder repairs in Melbourne, Specialised Cylinder Repairs Pty Ltd can supply. Professional solutions for all businesses. Tapping Machines are designed and built with the experience of over 50 years of precision tools and machines. They are powerful Drilling, Tapping and Cutting machines that are extremely versatile for drilling and threading in a given depth. Dynamic Hydrofab (DHF) is a reliable pioneer company specialized in manufacturing good quality of Hydraulic Cylinders and Tapping Machine. To know more about us call us at +91-99100 00424. Dynamic Hydrofab is the largest manufacturer and supplier of Hydraulic Cylinders, Industrial Hydraulic Cylinders, Automotive Hydraulic Cylinder, Tipping Cylinders, Telescopic Cylinders, Tapping Machine, Power Pack, AC Power Pack, Compact Power Pack and Goods Lift. 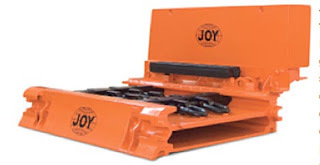 To know more about the products, please visit us at Hydraulic Cylinders Manufacturers India and Tapping Machine India. Or you can email us at: dhf@dhf.in, dhfdelhi@gmail.com or you can call us at: +91-99100 00424. A Hydraulic Cylinders from the #1 source of hydraulic components. Northern Tool offers pneumatic, agricultural, welded, tie rod + cross tube from a Leading Manufacturer & Supplier Of Tubes, Pipes And Hollow Sections.